The internet is incredible. Terrifying and wonderful in equal measures, it has completely changed the way we think, communicate and develop on a daily basis. While as a child I found it funny to think that my parents grew up without TV and computers in their family homes, my kids are going laugh at their dinosaur mum who can remember the arrival of the internet, rise of mobile communications and had her first (definitely not touch screen) phone at the ripe old age of 15. The internet has also had a huge impact on the foodie community. Where once we relied on a handful of suited and booted Michelin men to dictate our restaurant choices and Delia provided the first (last and only) word in creative home cooking, we’re now inundated with photos, blogs, news, reviews and instant updates from anywhere around the world. Pretty much every restaurant now puts its menu online, celebrity chefs and home cooks alike post their recipes for anyone to see and a world of wonderful bloggers write and tweet their way through culinary highlights to suit every taste going. When started blogging back in February, one of the first recipes I made was Dan Lepard’s Tahini Flapacks. I tweeted a link to my recipe post, mentioning his name, and within 6 hours I’d had hundreds of hits on a pretty much unknown blog, gained several followers on Twitter and received a photo from a woman based in the States who’d found my recipe and baked the flapjacks as a teatime treat for her kids that afternoon. All because of the internet. Incredible. The rise of the internet has also produced a whole industry of discounting , bargain-hunting and group incentives. If you look in the right places you can find a company to offer you pretty much anything at a cut price, from fine dining to chocolate-making masterclasses, afternoon tea and the Ritz and anything in between. One such company is Groupon. An overnight internet success sensation, it uses novelty and persistence (try three emails a day. Actually, please don’t.) to generate huge sales, substantial profits and a genuine connection between physical retailers and the online community. 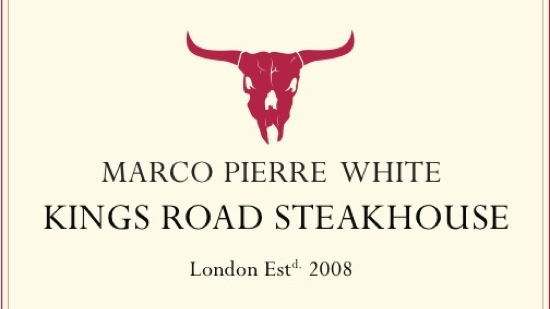 On Friday night Carniverous Boyfriend and I headed out for dinner with a couple of friends to Marco Pierre White’s London Steakhouse Co. on the Kings Road. Why? Well, why not. It was the start of Bank Holiday, we fancied some food and a few drinks, the restaurant isn’t far away and by all accounts it does pretty decent steak. Oh, and we had a Groupon offer. Main course, pudding and a cocktail all for the meager sum of £16. About the price of a main course and a glass of wine in most of your average high street restaurants, so pretty good value we thought. My bellini on arrival was pretty nice. A little on the small side if I had been paying the £8.50 price tag, and lacking the incredible fresh hit of versions I’ve had in Venice or at The River Cafe, but it’s slightly unfair to compare. It got me off to good start. As we sipped our cocktails and waited for our friends to arrive, an elderly, slightly flustered looking couple edged their way up to the bar and snatched the menu from under our noses. After some intent conferring with each other, and questioning of the barman, the man ordered an identical set of cocktails to ours in a thick Northern accent. ‘Groupon’ whispered the Yorkshire-born Carniverous Boyfriend with a grin. While it opens doors to new places at a fraction of the price, Groupon can be a mixed blessing. You can spot your fellow bargain hunters a mile off, the meal is peppered with slightly uneasy requests (‘Can we order this on the Groupon menu?’, ‘Do I have to pay extra for sides?’) and you always wonder whether the staff might just spit in the tap water you ordered to stop the cost of menu add-ons spiralling out of control. However apart from spotting the couple of elderly co-conspirators at the bar, our evening was pretty lacking in awkward moments. We even received four free glasses of champagne from the maitre’d after I’d tweeted to say we were coming that evening (there we go again, the power of the internet). A really nice gesture and one which definitely added a bargain hunting bonus to our already fairly frugal evening. So. What did we think of the food? My steak was great. 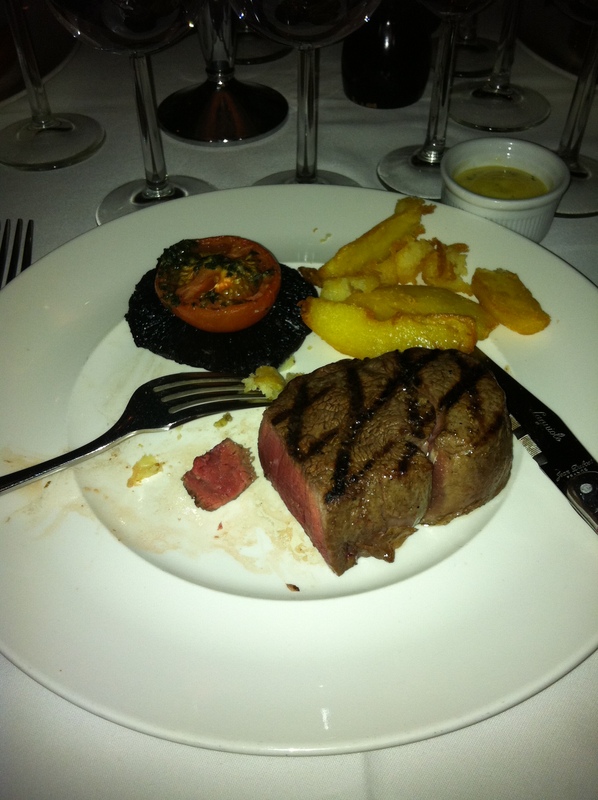 Ordered medium rare, it arrived beautifully seared with a rich, red inside and melted like meaty butter in my mouth. Possibly verging towards the rarer end of the spectrum, but good enough quality not to need overcooking, and absolutely spot on to my tastes. Triple cooked chips were fabulous; soft fluffy centres with a crunchy crust and just enough oil to crisp and ooze against the steak. A mixed salad came nicely dressed with an oniony French dressing, and the mushroom and tomato served with the steak were cooked well. 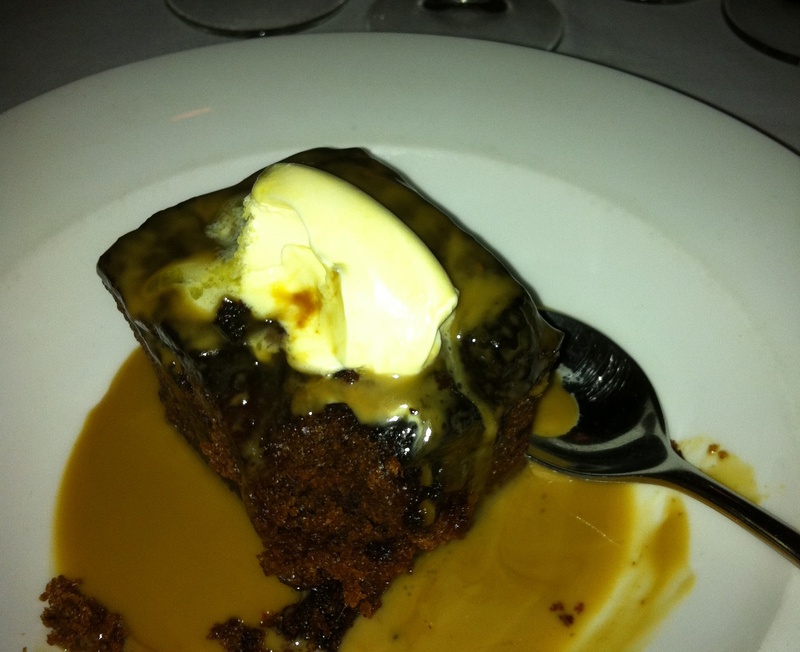 Dessert came in the form of a giant slab of sticky toffee pudding, served in a creamy puddle of sauce. I’d drooled over these puddings earlier as they came out the kitchen to a neighbouring table, topped with a huge scoop of vanilla ice cream, but ours arrived with nothing more than a scraping of clotted cream on top. I can only assume the kitchen had run out of ice cream (or were economising on our Groupon deal), and its a shame as the super-sticky sweetness of the pudding, while delicious, could really have done with something more simple and less rich to cut through the sugar. Overall verdict? A really nice meal. Well-cooked food, big flavours and a great way to spend a Friday night with friends. However while the meal was good, I don’t think I’d pay the fifty odd quid it would cost if I was going full price. This place just doesn’t have that extra wow factor either in ingredients or atmosphere and I’d rather spend a bit more (or not in fact) and head to Hawksmoor, Gaucho or even Sophie’s Steakhouse where the vibe is a bit more buzzy and the food that little bit more adventurous. But for sixteen pounds and a short taxi ride from home, I can’t complain. And, like it or not, that’s the joy of Groupon. I experienced dreadful customer service, don’t buy a Voucher. You are treated like a second class citizen. They feel that they can change their terms and conditions whenever they feel like it, give false information and not take any responsibility! Even when escalated to the very arrogant and rude ‘owner’ (James Robertson) we were treated with no respect and he didn’t listen to our complaints. It was evident that we were just a number and they didn’t care to rectify their mistakes. Avoid, avoid, avoid if you have any sense!